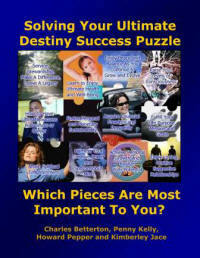 Solving Your "Ultimate Destiny Success Puzzle"
Which Pieces Are Most Important To You? Please read the free sample of 32 pages including Chapter Summaries from the 238 page E-book with quizzes, exercises, resources and bonuses. The ultimate goal of Ultimate Destiny is to help Expand the Circle of Success for Solving Our Personal, Community and Global Success Puzzles by helping establish a network of non-profit Community Resource Centers that will provide Successful Living Skills for the 21st Century. NOTE from the Publisher: This is not just a publication. It is part of a comprehensive system of interactive programs that offer advanced training in some of the most essential successful living skills for the 21st Century. It is also a “co-creative process” designed to continuously evolve over time through input and participation by readers like you. Click here for more background details. Please let us share our periodic Ultimate Destiny Newsletter with you! Just enter your primary email address in the box to the right. Click Here for a sample ezine. or a hopelessly twisted Rubik’s Cube? seeing the picture of the puzzle you are putting together? your ultimate possible future in life? attain spiritual enlightenment; raise your consciousness level; harness your creative mind power; make a difference and leave a legacy? see, believe and achieve all you can be, do and have stewardship over! "Solving Your Ultimate Destiny Success Puzzle!" 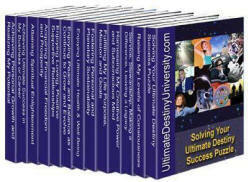 Are you ready to discover the real secrets to enjoying ultimate success in every area of life? This innovative book will help you achieve ultimate success in every facet of fulfilling your purpose and manifesting your ultimate destiny. The 4 coauthors have decades of experience in personal and professional development, empowerment, consciousness, coaching and counseling, community and economic development, and spiritual enlightenment. Solving Your Ultimate Destiny Success Puzzle. What’s Your UDQ (Ultimate Destiny Quotient)? How Well Are You Doing in Every Area Of Successful Living? Take our fun quizzes and discover your UDQ* score in every area! that will help you discover -- or rediscover – what you really want in life and how to get it. You’ll uncover your deepest desires. You’ll find out who you are, why you are here and where you are going. Then you’ll learn what you need to do to realize the richest results in the fastest time possible as you make those dreams reality. Ultimate Destiny has devoted thousands of hours to design an innovative system that will help you choose the resources that will be most valuable to you right now. Our goal: to help you see, believe and achieve everything you want to be, do and have stewardship over! Imagine this: You clearly envision your ultimate potential and you enjoy every aspect of life everyday as you progress toward your vision. You’re able to powerfully express yourself. You understand your true identity, vision and mission in life. You know how to be more effective and happy, and how to leverage your time, energy and money to enhance your ultimate success in every area of life. Wouldn't that be great? What if you could begin every day of the rest of your life in the highest possible state of mind, enjoying peace, tranquility and self-assurance as you follow your vision, knowing you are fulfilling your mission in life. How would that feel? Imagine being able to soar through life, enjoying happiness, fulfillment and satisfaction as you set and achieve your priority goals in every area of life. Imagine being able to clearly see, believe and achieve your unlimited potential as the co-creator of your life and your ultimate destiny. It truly is possible – IF you know how. That's what this brand new e-book "Solving Your Ultimate Destiny Success Puzzle," will help you to do. It's not like any other book you've ever read. for realizing more of your inherent potential. This book was designed for YOU. Every section is there because people just like you asked for it! We set up a simple webpage asking people what they needed to know in order to feel blessed, happy and fulfilled. Then we answered them! NO EXCESS FLUFF! JUST THE REAL ANSWERS YOU WANTED TO KNOW! 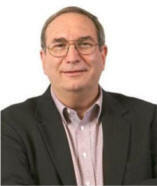 We tapped a variety of experts and developed the tools and techniques to help you realize your deepest desires and your fondest dreams, to discover who you are, why you are here, where you are going and what to do next to get there in the quickest time frame, with the richest results by using the most enjoyable processes. 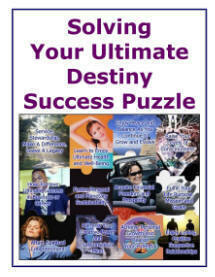 Here's a sneak peek at what you'll discover in "Solving Your Ultimate Destiny Success Puzzle." Learn how to always know what your dreams and desires are in every area of life . Enjoy the wonders of heart-mind coherence and balance. Produce maximum results from any activity and effort you expend. Ensure that you live, act and create from the highest possible levels of consciousness, empowerment and enlightenment. The little-known way to go within and let the Creative Power of the Universe show you how to see, believe and achieve the rich treasures that are your inheritance. Discover your soul's deepest desires and potential. Create your ideal life every day, moment by moment, as the powerful Co-creator you always have been. Enjoy the process of being led into perfect fields of growth and service and stewardship. Discover how to be constantly evolving your level of consciousness. Take control of your life and fulfill your ultimate destiny. fulfillment as you more clearly see, believe and achieve all you can be, do and have. and feelings so they propel you toward your dreams and desires to the greatest possible degree. 4 proven strategies for tapping your creative powers of imagination. you accomplish anything you want in life. Constantly improve and increase your levels of empowerment, enlightenment and consciousness. master of your fate and captain of your own ship as you create your ultimate destiny! Ø Imagine your ultimate destiny. Ø Envision and manifest your desired outcomes. Ø Honor and nurture your heart's desires. Ø Set and achieve empowering goals. Ø Develop and implement effective action plans. Ø Maintain joyful feelings of appreciation, bliss and gratitude. so they grow and take control of their ultimate destiny also. Have you been looking for something like this for ages? Here's one more sneak peek at what you'll discover in "Solving Your Ultimate Destiny Success Puzzle." How to successfully make the right choices every moment of every day that ultimately ensure your success in every area of life. How to tap your inherent powers of genius so you always enjoy the best possible results from every activity and every investment of time, energy and money. REVEALED! The hidden truth behind the 12 Secret Steps to discover and manifest your ultimate destiny! These steps are used by most highly successful individuals. Now, their secret is yours. 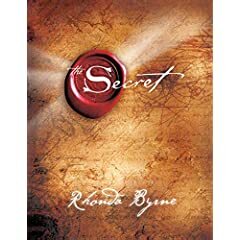 Your secret weapon for overcoming any fears, doubts, worries, negative thinking, low energy, mangled emotions, mental, physical and emotional handicaps. And that's just a fraction of what you'll find out in "Solving Your Ultimate Destiny Success Puzzle"
from now!) Click Here To Get Started NOW! To have someone do all this research for you would cost you at least a hundred dollars an hour, totaling $500? $5,000? $50,000? (We should know, that's what it cost us!). This isn't some boiler-plate collection of answers. It’s laser-guided accurate information that you need -- SPECIFICALLY the exercises, tools and techniques that will help you discover (or rediscover) your deepest desires, your fondest dreams and help you know who you are, why you are here, where you are going and what to do next to get there in the quickest time frame, with the richest results and the most enjoyable processes. Everything is explained in PLAIN English. Which means it's easy to read and understand. And it's logically laid out. "Solving Your Ultimate Destiny Success Puzzle" is such whole library of self-discovery information and guidance, and at such a bargain discount investment! That's right, you can get this information instantly, right now, at a fraction of what it cost our team to do the research. Why would we make it so affordable? Simply because we want to share this wisdom with others who will benefit from it and our costs to deliver it to you are so low. can be reading it and discovering and applying all these amazing secrets in as little as 5 minutes from now. we plan to at least double the cost. You can save at least HALF by ordering quickly. of the facets of fulfilling your ultimate destiny are most important to you and how satisfied you are in each area. and leverage by identifying activities that produce results in more than one area at the same time which helps you accomplish results which keeps you balanced and self-motivated. The introductory self-assessment exercises and quizzes help you discover your UDQ, your ultimate destiny quotient. You discover all you need to know about yourself, your priorities in every area, your learning style preferences, the areas where you will benefit most by applying effort. and Time-dated. As a result, you are far more effective in achieving your ultimate success. The application exercises include a12 part system for effectively developing your vision, goals and implementation strategies for each of the major areas including: listing what you don’t want; transforming that list into a list of what you do want; setting priority goals for ultimate success in each area; brain-storming the hurdles and obstacles you will need to overcome; and considering how you can nurture your heart’s desires in each area. As a result, you develop a clear vision, build a burning desire within to achieve the goals you have set which enables you to be as successful as possible with the least amount of effort and that keeps you excited and motivated to continue moving toward your ultimate destiny. and exercises in the program. the best of the rest, you will always be able to identify and obtain the next best resource you need. of the e-book gives you 10 positive practical steps you can take every day to maintain progress, keep yourself motivated and accelerate your accomplishments. The program introduces you to the advantages and benefits of becoming a charter member of Ultimate Destiny including special offers only available to members and students. As a result, you enjoy exclusive programs, substantial discounts, advance access to life-changing information, tools and systems and continuous training, coaching and mentoring. As a graduate of the Solving Your Ultimate Destiny Success Puzzle, you are qualified to apply for our coaching certification program. full or part time living. And finally, you are invited to participate in our Expanding the Circle of Success Campaign to help people all over the world realize more of their potential, partly by sponsoring local non-profit Empowerment Training Mentoring Systems. design and manifest your ultimate destiny which must inevitably come forth. every facet of successful living. Self-discovery Exercises, self-assessments & hundreds of Featured Resources. we launch it with the CD’s and print the book, we are offering you a special pre-launch price of only $14.97 for the E-book and $19.95 for the printed edition if you agree to share your review with us. Order your copy now because we are including the free 90 day trial membership in Ultimate Destiny University for the first 500 customers. Have No Regrets! Activate Your Ultimate Destiny Now! How would you like to look back from the future as you near the end of your life and have no regrets about how you lived your life? What if you waited too long to discover your life purpose? Would you have regrets like the seniors whose answers to a survey are provided in Have No Regrets? "If you could live your live over, what would you do differently?" * I would have carved out life goals and owned my life. Life was not practice, it was the real thing. I should have taken charge of my life with goal setting. Ultimate Destiny University provides the best selling goals program of all time, The Dynamics of Personal Goal Setting by Paul J. Meyer along with several other powerful programs by Brian Tracy, Jim Rohn, Les Brown, Mark Victor Hansen, Jack Canfield, Bob Proctor, T. Harv Eker, etc. * I would have taken better care of my health. I threw away health as though it were trash. Ultimate Destiny University is coalescing the world's best, tested and proven resources for taking better care of our members health, including programs and products from experts such as Deepak Chopra, Dr. Andrew Weil, Covert Bailey and nutritional food products from well established companies. * I would have managed my money a lot more effectively. * I would have worked on quality family goals a lot more. * I would have spent more time on personal development. * I would have had a lot more fun in my life. * I would have planned my career. * I would have lived in oneness with my God and or given more back to my community. education, knowledge and insight to utilize what we already have. and meaningful if they had had access to, and taken advantage of, the wealth of resources available to you today from Ultimate Destiny University. Just consider for a moment how many millions of people in America alone don't have nearly as much access to these types of development and transformational resources as executives do. That is part of the reason we created Ultimate Destiny University, published "Solving Your Ultimate Destiny Success Puzzle” and launched our Expanding the Circle of Success project to donate Empowerment Training Mentoring Systems through local non-profit organizations. best you can be. Find a place where people inspire you to reach for new heights. and "Solving Your Ultimate Destiny Success Puzzle” than “Someplace You Can Dream”. After all, we know that your dreams are waiting for you to come true, Imagine That! Free Bonuses Valued at Over $110. This amazing bonus is all about having insider access to resources that help individuals and members of companies and organizations discover and actualize more of their potential. The membership benefits include a monthly e-zine, special reports, periodic teleseminars and discounts of up to 40% on books, audio video programs and featured products. helpful poster, "5 Great Lessons to Help You Let Go and Live In the Now." Are you beginning to see how valuable this package is? 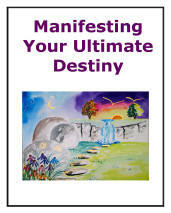 With this bonus, you'll know the essentials about designing your ultimate destiny day-by-day. How to design your ultimate destiny every moment of every day. How to control your thoughts, mental images and energy flow. How to help others you care about design their destiny. Discovering how to RUB your own magic lamp and grant your own wishes. Exercises to discover what "ultimate destiny" means to you. The Story of One Coauthor's Path from High-school Drop Out to Co-creator. The Ultimate Destiny Wheel of Life Exercise. The Golden Bridge Exercise that will help you accelerate your progress in achieving whatever ultimate vision you create for yourself. That's a total of over $110 in FREE Gifts! They're each worth every cent. But hey, they're yours FREE. Congratulations! These bonuses are part of a marketing test and won’t be included with this offer forever. So if you want them, get in quick. Okay! I get it. Send me my copy and my Free Bonuses NOW! "This is the most comprehensive collection of powerful insights, tested and proven tools and techniques for discovering your dreams and manifesting your ultimate destiny I have ever seen." As they say, the proof is in the pudding. And these people are super happy. Just like you'll be. You can't leave this page empty handed, can you? For a mere $14.97, you're getting the answers you need in the E-book edition... PLUS MORE to help you get started on the exciting journey of self-discovery. The best part of your life is about to begin! You can only get this product from us. It's not available in libraries or anywhere else on the net. Just imagine being able to get these powerful secrets and systems downloaded to you right away! You Are Fully Protected By Our 90 Day 100% Money-Back Guarantee! We want you to be 100% satisfied with our program and we're completely confident you will be. So let us remove all doubts for you . . . Order today and we guarantee your complete satisfaction or we will refund 100% of your investment! You could invest tens of thousands of dollars attending training programs with some of the world’s top trainers along with travel expenses, cost of lodging AND the tuition (as we have) or you can access the most important benefits of all those programs for only $14.97 for your personal copy of the E-book on “Solving Your Ultimate Destiny Success Puzzle" or $19.95 for the printed book. I’m Ready to Get Started! Send me my copy NOW! Congratulations on taking action now to activate your creative power and take control of your future. We look forward to helping you discover your dreams, fulfill your life purpose and manifest your ultimate destiny. As coauthors of “Solving Your Ultimate Destiny Success Puzzle", we wish you great success! PS. Join now to take advantage of this exclusive opportunity to enjoy all the benefits of being a Charter Member in Ultimate Destiny University at a special introductory rate and let our trained team of coaches help you enjoy greater success in every area of your life. PPS. Don't forget, you're getting $110+ worth of bonuses for just a fraction of that price – only $14.97 - and the offer is RISK FREE! You’ll get everything you need to get started: the exercises, tools and techniques that will help you discover (or rediscover) your deepest desires, your fondest dreams and help you know who you are, why you are here, where you are going and what to do next to get there in the quickest time frame, with the richest results by using the most enjoyable processes. for the E-book and print edition of "Solving Your Ultimate Destiny Success Puzzle". Click Here to buy the print book for only $19.95. Click here to buy the complete Ultimate Destiny Success System with over 1,200 pages, featuring 14 programs and hundreds of dollars worth of bonuses for only $77. Click Here to buy the complete system on a CD for only $97 plus $7.95 shipping & handling. Charter Membership in Ultimate Destiny University! prepay for a full year of Ultimate Destiny Membership benefits for only $197. 100% Satisfaction Guaranteed! You can cancel anytime for a refund for any unused membership. 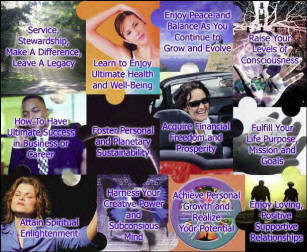 Solving Your Ultimate Destiny Success Puzzle is part of the Ultimate Destiny Success System for Expanding the Circle of Success by providing Successful Living Skills for the 21st Century through a network of local non-profit CAN DO! Community Resource Centers that will help generate greater individual and collective capacity for Solving Personal, Community, National and Global Ultimate Success Puzzles! Copyright 2010-2011 by Ultimate Destiny. All rights reserved.